Well, this blog title is a little optimistic but Adobe is again working on their flash compile for iPhone feature. Earlier this summer, Apple changed their developer terms of service to exclude cross compiling applications just three days before the launch of Adobe Flash CS5. One of the major features of the new Flash CS5 was the ability to compile the swf into a native iPhone application. The short notice wasn’t enough time for Adobe to make any changes to the impending product and Flash CS5 shipped with the feature. Today Apple announced changes to their developer application guidelines. I’m glad Apple stepped up and corrected this. Previously, the 3.3.1 statement limited any code not originally written in in C, C++, and Objective-C. In the mind of multilingual developers the 3.3.1 statement was crazy talk. Developers progress, learn and innovate by using libraries from other languages and making them work in new and unexpected ways. Often times this is done by rewriting, re-engineering and cross compiling libraries from various languages. 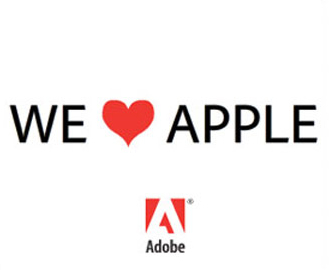 Could it be a response to Adobe’s brilliant advertisement campaign? Adobe Air has been a sucessful cross operating system development option for the desktop computer and I’m eager to see if the newly developing Air for Android will eventually be a viable cross platform development option for the mobile industry. Keep us posted on the progress Adob. This entry was posted on Thursday, September 9th, 2010 at 10:22 pm and is filed under Blog. You can follow any responses to this entry through the RSS 2.0 feed. You can leave a response, or trackback from your own site.